Given all of the political flack that I have received from three members of the Select Board about the Longmeadow Buzz blog and the links to it from the town website, it's interesting that the State of Massachusetts allows a link to following blog from the homepage of the official State website. We welcome your participation in this blog and we hope you will share your ideas, your encouragement, and your experience with fellow readers. Dissenting points of view are welcome, but we ask that you be respectful of our contributors, readers and participants. By commenting to this blog, you agree to the terms of this policy. The AGO reserves the right to change this policy at any time, without notification. This is a moderated blog. Comments are welcome at any time, but they will generally be reviewed and posted within regular business hours (Monday through Friday, 9:00 a.m. to 5:00 p.m.). Please do not resubmit your comment if it does not appear right away. All submitted comments are subject to review and approval by the AGO’s blog moderators before they will be posted. I would expect that the Massachusetts AGO would probably have moderated (censored) many (if not all) of Jerold Duquette's posts that have appeared on LongmeadowBuzz for objectionable content if they had been submitted to the state sponsored AGO blog. As Alex Grant pointed out in his Opinion column (Payback in Town Politics) published in this week's edition of the Longmeadow News, the LongmeadowBuzz blog was not the town website. He doubted that anyone was mislead to believe that the town website and the Buzz blog were one and the same thing. The fact of the matter is that there obviously needs to be some guidelines for the town website about acceptable links. The State of Massachusetts must approve of the above AGO's blog link because there is a prominent link to it on the official state website (see link at top right hand side on www.mass.gov, Connecting with Us). No specific guidelines for content or links have ever been formally established for the Longmeadow town website. However, the existence of links from the "official" town website to the Buzz blog for over two years without objection would appear to be implicit approval by the Select Board. As mentioned in a previous post there had been no request from the Select Board for removal of the LongmeadowBuzz link until July 14, 2010 and it was quickly removed without objection. First, thank you, Jim Moran, for your many years of service to the town. Your foresight, initiative and just plan hard work has provided us with a website that was informative, complete, easily navigable and attractive. Thanks for the pictures, the articles, the buzz, the biz. Thanks for tracking down unposted minutes of governmental bodies. Thanks for demanding accuracy and completeness from reluctant public officials. This was not a .gov website. This was a .org website, a non-profit venture more like a newspaper than a town report. And, it was clearly a labor of love, not just love of government but love of Longmeadow. The actions of the Longmeadow Select Board in publicly chastising you and then “firing” you from your unpaid volunteer work as webmaster are purely political. This was no calm discussion of content and links. It was not a desire to give more work to the town’s lone IT person. It was punishment because you did not support the school building project. And, furthermore, you had the audacity to print (here on this blog at longmeadowbuzz.blogspot.com) 6-month old official correspondence about the project that raised serious questions, correspondence that had been obtained through a Freedom of Information request by another town group. I wish you the best of luck in your new venture, longmeadowMA.org. I know it will be as reasoned and responsible as you have always been. A little more audacity would be okay too. During the July 12 Longmeadow Select Board meeting (see previous posting for video clip of discussion) it was made very clear by Chairman Rob Aseltine that there was a need for a significant revamping of the Longmeadow.org town website and institution of new policy guidelines for allowable website content and links. 1. 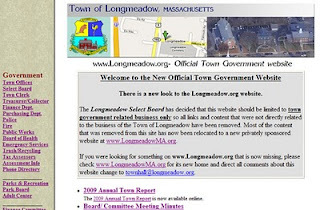 The town website should primarily reflect the official business of the Town of Longmeadow. 2. There should be no links or connections to any business related ventures. 3. Inclusion of any non-town government related groups should be considered on a case-by-case basis. 1. http://www.longmeadow.org/ - the new official Town Government website with a new masthead reflecting a new focus. All of the information related to Town Government was left untouched and easily accessible. 2. http://www.longmeadowma.org/ - a newly created privately supported website for all of the components that probably didn’t belong on Longmeadow.org given the strongly expressed views of the majority of the Select Board. The website changes were made on Sunday night so as not to cause any inconvenience or confusion to town residents and was online Monday morning with an explanation as to what happened. …. even today, there are no policy guidelines in place so I didn’t feel that I needed any approval. What happened on Monday morning was completely unexpected given my best intentions and the situation quickly got out of hand… The Select Board Chairman issued a direct order to regain control of the website which meant changing the password for the town website server and the webmaster@longmeadow.org email account. This happened by 10 am Monday morning. By the end of the Select Board meeting Monday night, Jim Moran had been officially removed as town webmaster for becoming an “insubordinate volunteer”. Interestingly enough, there was no attempt on Monday morning or any time during the remainder of the day to communicate by phone or email to inquire as to what had happened. Below is a video clip (courtesy of LCTV) of the Select Board discussion. Anyone who has followed this heated discussion and is familiar with the situation knows that the issue was not about the town website and how it was maintained. The issue was about removing easy access to information not readily available on the town website (namely the LongmeadowBuzz blog). Anyone who says otherwise is not familiar with all of the facts. It is interesting that the link to the LongmeadowBuzz blog which has caused all of this furor has been on the town website for about 2½ years. Only when information and commentary about some town officials and employees involved about the High School Building Project was posted on LongmeadowBuzz did it ignite the current heated debate. When asked to remove all links to LongmeadowBuzz from the town website on July 14, they were quickly removed without objection. There had been no request to remove the LongmeadowBuzz link by the Select Board or Town Manager prior to July 14. Will his next move be to have my name removed from the plaque in the Longmeadow Town Hall recognizing my selection as Citizen of the Year for 2005 for my outstanding community service work on the town website?